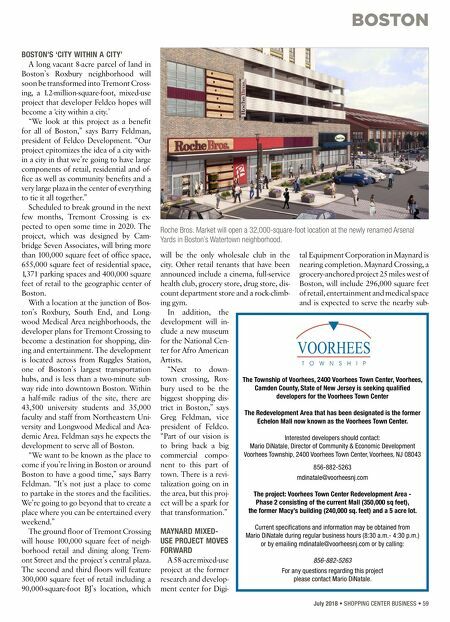 BOSTON 58 • SHOPPING CENTER BUSINESS • July 2018 B oston's retail landscape continues to change amid waves of sustained commercial development and growth that shows no signs of slowing. An estimated 1.2 million square feet of retail will be completed in 2018, up from 1.1 million square feet in 2017 and 915,000 square feet in 2016, according to research from Marcus & Millichap. Several new large-scale mixed-use projects in the sub- urbs of Boston are due for delivery later this year or in 2019. In addition, a number of projects with a large retail component are in the process of being delivered in Boston proper. "We've never had this amount of de- velopment in the 30 years that I've been in the business," says Peter Montesanto, who leads Colliers International's Boston Retail Team. "I think there was a true lack of retail space before. Historically, Boston has been very conservative on de- velopment, so there's been somewhat of a lack of inventory, and I still think that's the case." Even with the 1.1 million square feet of retail delivered in 2017, vacancy rates continue to be tight. Metro-wide, vacan- cy rates currently sit at 2.6 percent with average asking rents at $21.68 per-square- foot, an increase of 4 percent from 2017, according to Marcus & Millichap. In Boston's Seaport district, WS De- velopment is redeveloping 23 acres it ac- quired in 2015 for $359 million. Called Seaport Square, the 7.6 million-square- foot project will include 3.2 million square feet of residential with 3,200 units; 2.8 million square feet of office space; sev- eral hotels; 5,500 parking spaces and 1.1 million square feet of retail, including 2.5 linear miles of street-front retail when it is ultimately completed. In May, tech giant Amazon announced it would open a 430,000-square-foot of- fice at Seaport Square, bringing 2,000 technology jobs to Boston. The office is slated to open in 2021. Amazon is one of a number of technology companies to open offices in Boston, which has a plentiful supply of college graduates, who create a well-educated workforce. 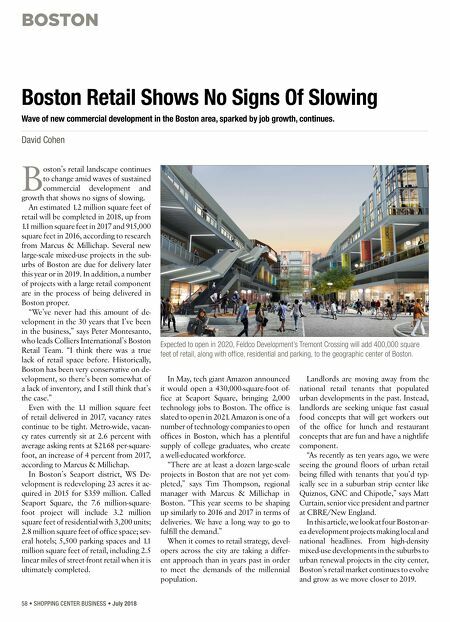 "There are at least a dozen large-scale projects in Boston that are not yet com- pleted," says Tim Thompson, regional manager with Marcus & Millichap in Boston. "This year seems to be shaping up similarly to 2016 and 2017 in terms of deliveries. We have a long way to go to fulfill the demand." When it comes to retail strategy, devel- opers across the city are taking a differ- ent approach than in years past in order to meet the demands of the millennial population. Landlords are moving away from the national retail tenants that populated urban developments in the past. Instead, landlords are seeking unique fast casual food concepts that will get workers out of the office for lunch and restaurant concepts that are fun and have a nightlife component. "As recently as ten years ago, we were seeing the ground floors of urban retail being filled with tenants that you'd typ- ically see in a suburban strip center like Quiznos, GNC and Chipotle," says Matt Curtain, senior vice president and partner at CBRE/New England. In this article, we look at four Boston-ar- ea development projects making local and national headlines. From high-density mixed-use developments in the suburbs to urban renewal projects in the city center, Boston's retail market continues to evolve and grow as we move closer to 2019. Boston Retail Shows No Signs Of Slowing Wave of new commercial development in the Boston area, sparked by job growth, continues. David Cohen Expected to open in 2020, Feldco Development's Tremont Crossing will add 400,000 square feet of retail, along with office, residential and parking, to the geographic center of Boston.